The dragon of the Zodiac and the private doctor to the Sohma clan. Hatori is serious and is often without a sense of humor. It's his job to erase the memories of those who discover the Sohma clan secret, though it is not entirely clear if this is simply a form of hypnosis or more of a supernatural power. When his curse activates he turns into a seahorse rather than an actual dragon, because the Chinese consider the seahorse to be baby dragons and the actual name in Japanese translates to it. He is very self-conscious about his transformation in the fact that he is the "great and powerful dragon" but appears as a "seahorse." He has had a bad experience in love with his "Spring," a woman named Kana who was the assistant in his office. 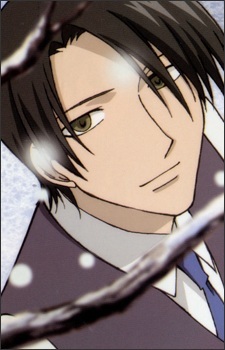 The relationship ended when Hatori asked Akito to give him permission to marry Kana. Akito threw a pot at Hatori and left him almost blind in the left eye. Kana felt so guilty about the incident and blamed herself completely. She was eventually driven insane with depression and guilt to the point where Hatori was forced to erase her memory in order to ease her suffering. Like Shigure and Ayame, he is very tall, and he is really a nice guy upon deeper inspection.